Targus Feren notebook case can fit laptop computer up to 15.4″ in screen size and is made of nylon. 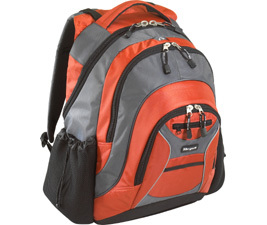 Targus Feren backpack for laptop features padded notebook compartment, water resistant bottom help protect valuables, insulated front pocket and side water bottle pockets for food and beverage storage, front zippered pocket, pen loops, elastic pocket, mesh pocket, zippered compartment, detachable key ring, removable cell phone holder, 4-slot CD/DVD sleeve and MP3 player compartment. Targus Feren available in Olive and Orange colors. NotebookReview reviews Targus Feren laptop backpack case and concludes that it’s good for variety of colors, not just the boring old black, lots of pockets and zippers and fairly well priced if you look around. However, some cons are just a tad too small for liking, still big enough to fit a laptop in, and a couple of books in though and strap for holding bag down is a little short. Laptop Magazine (dead link) votes Targus Feren as onee of the “Best Notebook Cases Under $100” in May 2006 issues and concludes that the Targus Feren Backpack is all about keeping your gear protected and organized – and your stomach full. In addition to an MP3 player pocket, detachable cell phone holder, and slots to hold four DVDs or CDs, this pack features an insulated front pocket for food and side pockets for beverages. Targus’ latest is designed to fit notebooks up to 15.4 inches, comes in either orange or olive green, and measures 15.1 x 18.1 x 7.1 inches. If you need to walk around outdoors, the Feren accommodates with its durable nylon fabric and water-resistant bottom.